The Eastern Phoebe, springs first flycatcher, arrives at the first hint of buds begining to burst from tree branches. The call of fee-bee is often confused with the call of the Black-Capped Chickadee bird. However, whereas the Chickadees call is drawn out and drops in pitch, the Phoebe's is explosive and rises sharpley. Measuring about 5 to 7 inches long with gray-brown above, and whitish below. No eye-ring or wing bars on this bird. Usually seen near water. While perching, this bird will pump its tail, watching for insects. Males defend territories of several acres. While pairs are generally monogamous, males birds will sometimes mate with a second female during the same breeding season. This happens primarily due to the fact that the first male Phoebe is still feeding the fledglings, allowing an unguarded female bird to mate with another male as she begins a second nesting. The nest is a cup of mud and moss, lined with fine grasses. This bird has adapted well to the structures of man. Making use of understreet culverts, bridges, and overhangs of barns and garages. The female does all the nest building and incubation. Often chasing the male away from the nesting site. If a nesting site is well-protected it will be upgraded and used for many years. The female lays 4 to 5 white eggs, occasionally spotted with brown. The eggs are incubated about 14 to 17 days and the young will leave the nest in 15 to 17 days after hatching. Eastern Phoebes will attempt to raise 2, sometimes 3 broods a year. Try placing a nesting shelf under the overhangs of out-buildings and garages to attract a nesting pair. This bird feeds on a diet of insects and spiders captured in flight and on the ground. These birds will linger well into the fall, some will even attempt overwintering, shifting their diet to berries. 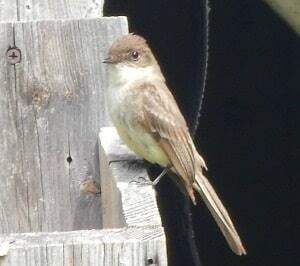 The Eastern Phoebe is the only flycatcher that winters in southeastern U.S.